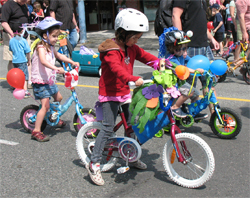 By: Point Grey FiestaStep 1: Decorate your bike on Friday – it’s free! How: Fiesta volunteers will help you decorate your bike for the big parade on Saturday. All decorating materials are provided free of charge. Step 2: Be part of the Saturday parade! Where: Meet at 9:30 am in the marshalling area on West 10th and Tolmie on the south side beside the BC Hydro sub station. How: The contest and awards will take place first and then we’ll all ride in the parade. All participants will receive a prize. There will also be prizes for each age group (4-7, 8-11), for the craziest bike and the best overall bike.